I hope you know that I take my job seriously. A number of you asked for a Pimm’s Cup recipe, so I’ve been drinking a lot of it. Just for you. 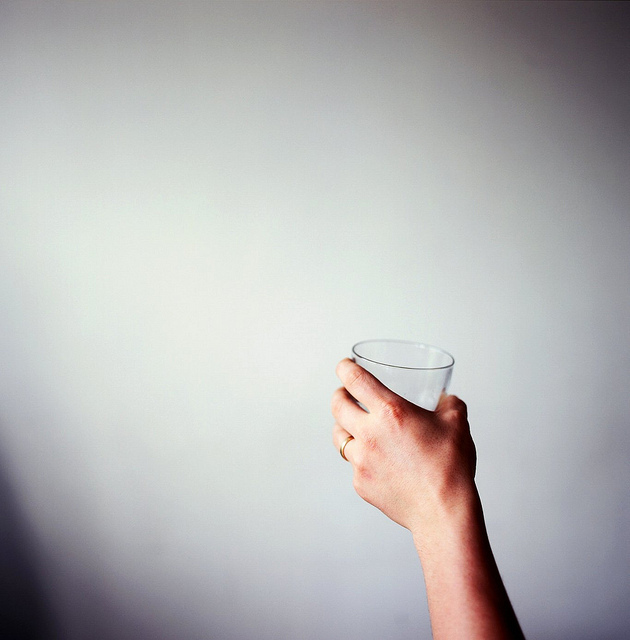 That’s Brandon’s hand there, and actually, he’s holding a gin and tonic, but it doesn’t matter. The gesture is what counts. Long live Pimm’s Cup! Cheers! I first tasted Pimm’s in its native city of London, where it came to the table in a pitcher, mixed with fizzy lemonade to a handsome shade of amber. There were slices of cucumber, lemon, and strawberry floating among the ice cubes, and a sprig of mint, and it was very hot outside, very hot, and after I drank a glass of it, I had one of the finest summer afternoons in memory. I cannot prove that the two events were causally related, but in my personal catalog of experiences, they’re on the same page. I keep thinking that somehow, if I drink enough Pimm’s, I’ll wind up back in London, or in an episode of Jeeves and Wooster, but I usually just wind up falling asleep early, fully clothed, forgetting to brush my teeth, in Seattle. I get the sense that a lot of you have had Pimm’s, but for those of you who haven’t, it’s a gin-based drink containing quinine – the substance that gives tonic water its bitter flavor – and various herbs, and probably a bunch of other ingredients, though the formula is a secret. It was made to serve as a digestif, but few drink it straight. On its own, it’s quite intense, with a flavor that combines citrus and spice with a little burnt caramel. On its own, it tastes like Christmas, only bitter. It tastes like the Christmas when I was fifteen, when I had the flu and my mother gave me a plaid flannel dress and a belt made from recycled car tires and bottle caps, and I cried when she asked me to try it on. Needless to say, Pimm’s is best mixed, if you ask me, and that’s how it’s most commonly served. Once mixed, it mellows considerably. It’s bright, refreshing, embarrassingly easy to drink. The British mix it most often with what they call lemonade, though it’s not the same thing as American lemonade; it’s a clear, sparkling lemon soda, and it’s sweet, but not too sweet. In the States, a decent substitute is 7-Up, or Sprite. It’s also acceptable to mix it with ginger ale or ginger beer. Except that I don’t really care for that ginger ale up there, Reed’s Extra Ginger Brew, in my Pimm’s Cup. I meant to buy Reed’s Original Ginger Brew. Until I took that picture, I didn’t realize that I had bought the wrong kind. In any case, Reed’s is a good grocery-store bet, but if you’re in Seattle and have access to Rachel’s Ginger Beer, for god’s sake, use that. It’s the best. At any rate, there are a lot of possibilities when it comes to making a Pimm’s-based cocktail, and you can find many of them here, or on the official Pimm’s website, which I’m crazy for. To get into the site, on the page where you input your birth date, the “submit” button doesn’t just say “submit,” but instead “Tally ho, IN we go!” That’s the spirit! Then, once you’re in, the home page treats you to a video of a pitcher being filled – mysteriously, benevolently, from an unseen hand above – with ice, Pimm’s, lemonade, and fruit, all of it splashing around and catching the sunlight in a relentlessly juicy way, so mesmerizing that I’ve hit “reload” on the Pimm’s website six times since I started writing this sentence. This to say that I’ve been reading up on Pimm’s, and doing my homework, and in the name of research, I’ve made Pimm’s cocktails six different ways in the past few weeks. I’ve tried Pimm’s with 7-Up, Reed’s Original Ginger Brew, Reed’s Premium Ginger Brew, Reed’s Extra Ginger Brew, San Pellegrino Limonata, and, finally, a mixture of American lemonade and sparkling water. Whatever you mix it with, it’s standard to use 1 part Pimm’s to 3 parts mixer, and that’s what I’ve done. Plus slices of lemon and cucumber, and a slice of strawberry, and mint. All told, and with apologies to any lemonade or 7-Up die-hards out there, I like my Pimm’s best with ginger beer. It’s a little more complex, a little less sweet, and with a squeeze of lemon, it’s what I’m going to be drinking for the rest of the summer, starting tonight. Happy Friday. The recipe below is for one serving, but to make a pitcher, just scale up accordingly, keeping the 1:3 ratio of Pimm’s to ginger beer. Combine the Pimm’s and ginger beer in a Collins glass, or something similar. Add ice until the liquid comes almost to the rim of the glass. Add the cucumber, lemon, and strawberry, plus a small squeeze of lemon juice, if you like. Use a straw to bash the fruit around a little bit. Add the mint, and serve immediately. The tone in this post and the way it's written remind me of classic Orangette. I'm not even sure what I mean – maybe your voice seems more immediate. In the end, what I mean to say is that I liked it very much. I don't know if you guys have it over there, but borage (starflower) is THE traditional thing to put in Pimm's (and so pretty too). Cucumber is easier to get hold of, but borage is the classic. The flowers are edible as well, and taste faintly cucumber-y. I bought a fresh bottle of Pimm's no. 1 on the first warm day of spring, back in April. Since we've seen few summery days since then, it has spent most of its time holed up in the cupboard, but I think it's just about time to pull it back out. I've never had cucumbers in the house when I've also had Pimm's and ginger ale – does it actually do anything for the flavor, or is it just a pretty garnish? loved this piece. very jaunty! I like my Pimms best with one of those intense and sour lemon sodas – like Pellegrino Limonata, or the Whole Food's House Brand Lemon Soda (Trader Joe's French Market Lemonade is closer to British lemonade but is IMO too sweet). And preferably drunk outside overlooking one of those giant lawns, shimmering in a heat haze, while wearing an absurdly large hat. Have you tried the other Pimms? Pimms No. 1 is the classic Pimm's Cup ingredient, but there are five more. Or there were. Wikipedia seems to think they're phased out. Isn't the Pimm's website the best? And we finally have a warm, sunny, Pimm's-worthy day in Seattle today. Hooray! OMG, I have never heard of it, but can't wait to try it. Just sounds so good on hot summer evenings. I would also like to suggest that you try Gosling's ginger beer. It's the most spicy/complex ginger beer you can find state side in my opinion. You can usually find it in liquor stores. Can't wait to try one! It's really really hot in Virginia! Do you still have the recycled belt? Seriously, thank you for the information and the final (best of) recipe! I've never experienced this beverage, so I now must do a little taste testing of my own… for research purposes of course. had Pimm's #1 Cup at Wimbledon 3 weeks ago (my 1st trip to Europe, my 1st Pimm's! )It was so hot and it tasted so good! You nailed it, refreshing. The cucumber, mint, orange and lemon all seemed necessary. Did the limonata work? or Vernor's? I'd best get busy…currently 93 here in the midwest, so we need this! I have had many a Pimm's Cup and tried it many ways. There is even a rumor that the Napoleon House in New Orleans (where it is something of a signature drink) makes theirs with Country Time Lemonade powder mix. I can't speak to that but I prefer mine with a basic “American” style lemonade: water, fresh lemon juice and sugar or simple syrup (I like to make simple syrup with a good raw type cane sugar). I generally use a Collins glass (although a mason jar works in a pinch) filled with ice, one and a half ounces of Pimm's No.1 and then top it off with said lemonade. Garnished with a cucumber or maybe a strawberry of they are in season. Great drink. I think I might go make one right now. Thanks for the reminder. Ooh aren't YOU a trooper to test Pimms so thoroughly? New Orleans also is known for its Pimms' Cup (especially Napoleon House, which has been around since 1797!). I tend to go with sparkling lemonade, but I'm definitely going to try the ginger beer/brew/ale option next. I think I'll probably love this. My first thought was, “Bah. Our dumb state-run liquor stores probably don't carry this.” But then I realized you probably bought it at one of our dumb Washington liquor stores, so I was heartened. 🙂 I look forward to testing many variations on the recipes you gave. someone just left you a comment using the word 'jaunty' – i think that's the mark of a good post. loved reading this. and that afternoon was magic. tally ho! happy weekend. I suppose I'll finish a bottle or two of our current spirits before I move on to Pimm's, but it is SO tempting. The world's finest Pimm's Cup is served at the Napoleon House in New Orleans, right in the Quarter. Just file that away for the next time you are in the Big Easy. I have spent many a late summer afternoon at my neighbor's house, sipping a Pims Cup and watching the kids play in the sandbox (a LATE afternoon, for the record!) I have to try this version! Cheers! Saw this post, which inspired me to combine the Pimms (sitting on the kitchen counter) with the ginger beer (http://www.netcooks.com/recipes/Beverages/Dave's.Ginger.Beer.html, made a month or so ago, and probably ~6.5%abv already, without the Pimms). Very good idea, but it may require a health warning! Mmm… I bet it would be very good with Trader Joe's French Market sparkling lemonade. I tried Pims 2 summers ago and the 7-up and ginger ale were horrendously sweet. But I don't really like how sweet most pop is anyway. I definitely need to try it with ginger beer. I considered making my own ginger infused simple syrup and making it with club soda. I still have some left stashed at a friends house. I'll have to give it a go next time I'm over there. The Trader Joe's where I live carries a sparkling lemonade that, to me, is the perfect mixer with Pimms (with a sprig of mint & a cucumber for me!) 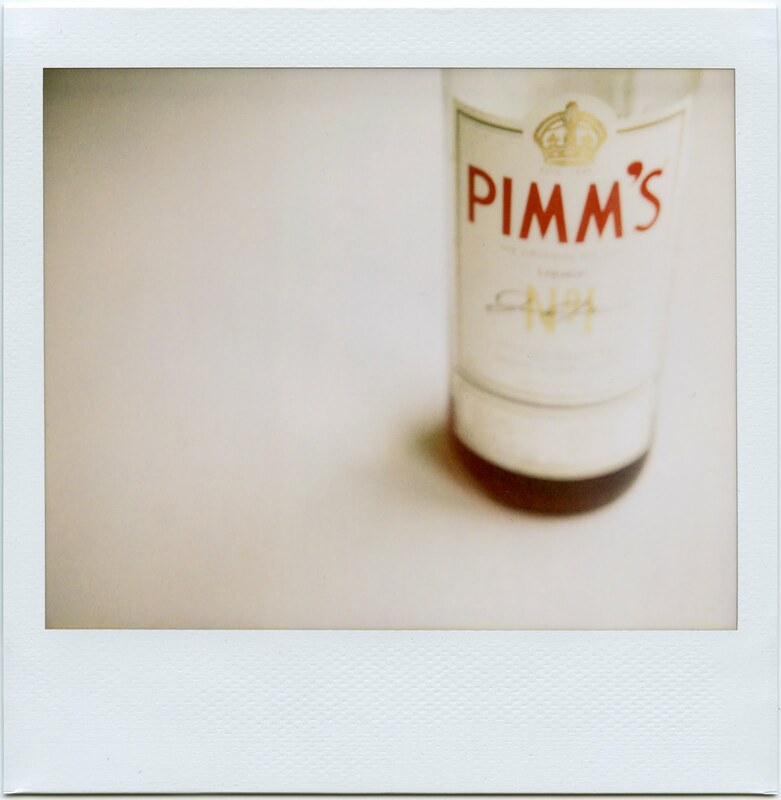 – of all the Pimm's mixes I've tasted that one comes closest to what I consider the “real” thing. Lovely! So glad you posted this. It is also on my summer short list. I'm going to try making a less-sweet Pimm's Cup. I am thankful, however, for your diligent research! That sounds pretty amazing. I just arrived in Walla Walla from Seattle, where I'm about to relax with a nice, glass of Cab or Malbac or something with nice WW terroir. But upon returning home, I will be giving your recipe a try. Can't say I've ever tasted Pimm's, at least not on its own. Thanks for educating us! Hi, all! Thanks for so much good discussion here. Megan, that makes me very happy! Thank you. Ella, I wish we could get borage more easily over here! It's very hard to find, and actually, if you want to have it on hand, you pretty much have to grow it yourself. Margie, the cucumber doesn't contribute a lot of flavor, but I do think it contributes a little, yes. I'd call it a slight savory quality. Anonymous, I'll have to get some Diet 7-Up and try it! I usually steer clear of diet stuff, but if you say so, I'm game. Amy and Kirsten, you can definitely find Pimm's at liquor stores around here. Brandon bought ours, and he went to one of the stores in Ballard. I can't remember which, but either the one on 15th Avenue (around 80th Street) or the one on Market Street (around 28th Avenue). Kate @ Savour Fare, to the best of my knowledge, the only types that are still made are Pimm's No. 1 and Pimm's No. 6, but the 6 is very hard to find. There's also apparently a new-ish one called Pimm's Winter Cup, but I can't find a lot of information about it. getoutofmykitchen, I've heard about Gosling's ginger beer, and I want to try it! I'll keep an eye out. Beth, the sad truth is that I never wore the belt, and that I hid it away in a closet, and I'm not sure what has happened to it now. It's still a bit of a bad memory. Kelly, I thought it was alright with San Pellegrino Limonata, but to the tell you the truth, the lemon flavor was sort of overpowering. That didn't stop me from drinking it, but I didn't love it. I might have to try it again, though. And as for Vernor's, I don't often see it around here, so I haven't tried it with Pimm's. If you try it, let me know. Kathy, I'll have to try Fentimans and the Maine Root stuff! Thank you for the tip. I tend to grab Reed's, because it's quite good and easy to find, but it's not particularly special. You know? BryanR and Ian: one of our staff members at Delancey makes an amazing ginger beer that we serve on tap, and she's hoping to market it someday. It's fantastic – very spicy, with a nice kick of lemon and just a little sweetness. When she gets all set up so that she can sell it commercially, I'll have to amend my recipe here, because it's going to make a killer mixer for Pimm's. It'll be sold under the label Rachel's Ginger Beer. Unfortunately, I am one of the few who have yet to experience Pimms. I've read a few blogs about it this summer, but none had posted a recipe I cared to try. So thank you! I only discovered Pimms recently, but I've been practicing for summer! I like mine with lime, strawberries and ginger beer, although lemonade is good in a pinch. It's winter here but I seriously can't wait to make a big jug and serve it with a great outdoorsy lunch on a warm day. I think I like it even better than sangria, and that's a big call! i'm a british chick who now calls seattle home… been meaning to post on your stuff for a while, but never felt like i had a right to until now… but now i have my IN, baby!! so tally ho & in we go!! anyhoo, thanks for all the good reading. enjoy the pims & whatnot… pip pip, cheerio & all that! Oh my! I have to admit after I read your summer list I went right out and bought an embarrassing assortment of tonic, Reed's Original and Extra Ginger Beer, Gin, San Pellegrino, and Pims. I was to try a million or so combination, but hey, you did for me! Looking forward to trying this one. This looked so enticing I stopped for a bottle of Pimm's and a 4-pack of Reed's on the way home. I don't know what Pimm's Cup tastes like in London, but this version is my new favorite summer cocktail! Thank you for sharing, Molly! i've never heard of pimm's, and now i'm wondering how this is even possible. you sold me with the jeeves and wooster reference. at any rate, now i must have a pimm's cocktail. my mission for the week! It cracked me up when I read Pimm's Cup on your summer 'To Do' list. I'm obsessed with Pimm's cups ever since my first one on a chilly rooftop bar in SF (totally out of place for this drink but I was in love). You can imagine the looks one gets asking for Pimm's No. 1 in a local Hawaiian liquor store! This summer we've been enjoying them under the hood of 1980 Rolls Royce. Once the car is restored maybe I will drive to Trader Vicks, surely they too will understand. Heh, wow, I don't even care about Pimm's (sorry), but the voice on this post made me so very gleeful that I had to comment and tell you how very awesome you are. I had the winter Pimm's in a giant igloo tent in London once. They had barrels of apples and fake snow everywhere on guy fox day so everyone was running around with masks and whooping it up in a rather joyous fashion. It was both surreal and wonderful. Because of this I had never considered Pimm's as a summer appropriate drink. It was solidly connected to igloos in my mind. I am so happy that you have given me reason to challenge my previously held beliefs!! My local pub here in London does an excellent Pimms. They make it with Appletiser – which I presume you have in the US? – if you don't, it's fizzy apple juice – and blackberries along with mint and cucumber. It seems an odd combination, but it really works I'm a bit of a Pimms expert – as soon as the sun shines, my usual red wine goes out of the window and Pimms becomes my tipple of choice – and the Appletiser version is definitely a delicious and worth trying variation. I also highly recommend ginger beer, it gives the flavour a richness and spice that lemonade doesn't have, even though lemonade is still delicious with it. I just found this blog and already I feel right at home! As a hardened Pimms drinker from Blighty I have read with glee the excitement your diligent research has created. If I could mention a (big) splash of Sloe Gin in the bottom of the glass with the mixer of your choice or for a real celebration (or just because you can) then quite frankly only Champagne will do! My day is complete :~) Toodle Pip! If/when you make it out to Boston, you have to try the Pimm's cup at the Marliave. I've taken the mission of finding a decent Pimm's cup in New England quite seriously: they don't mess around. Having a few reminds me of summer … having a few more reminds me of regret. It's both lovely and dangerous. 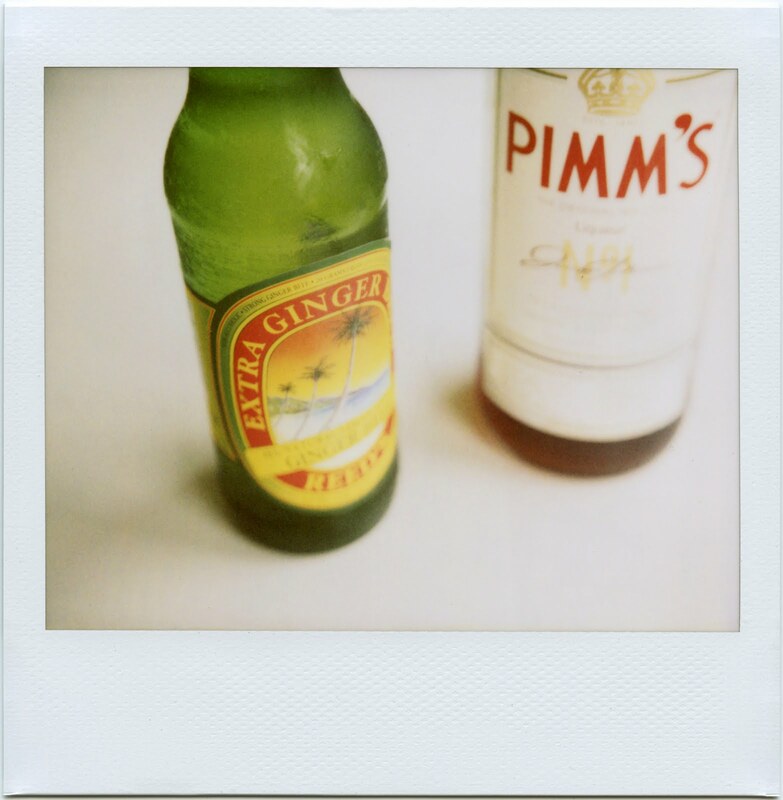 Sadly, I too am inexperienced in the realm of Pimm's…but can get behind anything with ginger beer in it! Thanks for doing all of the homework for us! brian's so right. that afternoon was total magic. one might even say jauntily magical. and i've never had pimm's with ginger beer. i think that needs to be rectified. i used to love pimm's when i was living in england but haven't been able to recreate the real thing myself! can't wait to try this recipe and use up those bottle of pimms i have sitting around! Well, now I have to try Pimm's and decide what I like best with it…okay, really that's just an excuse to get snockered. Cheers…in the eyes! Molly, if you find lemonade (aka Sprite) too sweet, you can try substituting some (or all of it) for tonic water. The next logical step is to throw in a bit of gin too, but that makes it more of an evening drink rather than an afternoon refreshment. 😉 It's great though! Winter Pimm's is absolutely lovely, I think it's made from brandy and has a lot of spices. It's normally drunk warm with apple juice. Yum! Funny great post. For those in the heat wave part of the country, your local liquor store may be out. Three weeks ago, disgusted by the 90+ degree weather, I looked up Sangria recipes on epicurious. Seemed that and drying wet laundry was what the weather was good for. One recipe asked for Pimm's Cup, and it was sold out, as were other Sangria ingredients. Tis the season!! Can't wait to get some and have it with ginger beer!! I have never enjoyed Pimm's, but I get weak in the knees for ginger beer. Maybe that's the substitution I need to become a Pimm's convert. Or, perhaps I'll just stick to the ginger beer. I'll be looking for Reed's Original when I do my Sunday grocery run! I think I'll try this, precisely as you've outlined. A little more complex and a little less sweet is just what I'm sure to enjoy. Thanks for researching and testing for us. Love this and will give it a try – Lately I have been working on 10 different ways to enjoy Campari so I feel your pain when it comes to research like this! Thanks for clearing that up. I've been confused by various recipes, some calling for lemonade and some for lemon-lime soda. I remembered the Pimm's I had in London had something fizzy from the tap. Can't wait to try this! My current favorite summer drink is gin, fresh lemonade, fresh watermelon puree, a little mint and lots of ice. Scrumptious. I loved your Pimms post. Having been brought up on this quintessentially British Summer drink. “Anyone for a Pimms” certainty heralds summer for me. I like to drink mine with tonic water. I was once asked if I wanted a single or double – I was horrified – Pimms should not be made like that, for a perfect Pimms it should never be made too strong, but it will always leave you giggling. When I was a kid we used to take narrow boat holidays and my mum would make up a big batch of Pimms for sipping on deck (For the adults!) She would fill the jug with fruit but never give that much out because at the end of the trip she would serve up a fruit salad made from the marinated fruit, cucumber, strawberries and apples with mint. Pimms Winter is Brandy based drink rather then Gin. I think that was why there were 6 varieties at first all based on different liquors, but now there are only the two, and the Winter one has been a recent relaunch in the UK about 4 years ago. It's recommended you drink 1 part Pimms to 3 Parts warm apple juice, we served it up for a Fireworks party as a punch with orange and apple juice and slices of orange and ginger root, but it works just as well cold with lemonade or appletiser. Hello, Your post made me think back to when I first fell in love with Pimm's but not the popular No.1 instead I fell head over heals for Pimm's No.3 Winter. I know the weather is too hot for you to think about warm, winter drinks but this one is fabulous. I simmer it with ginger ale and add slices of apples. Delish! Here's my posting about how I fell in love with Pimm's No.3 Winter if you're interested. Thanks so much for this! I've been trying some very dissatisfying Pimm's recipes this summer and this one finally hit the spot! Just the ticket for this hot South Texas summer. A sparkling pitcher of Pimm's has often been the highlight of one of my “veddy British” afternoon teas in the gazebo on a perfect summer day. Of course, my secret recipe had to be arrived at through careful testing like you've just had to endure! I've been drinking Pimm's all summer thanks to you and Deb at smitten kitchen reminding me about it. I have been mixing mine with French sparkling lemonade as I cannot find ginger beer here (sniff). My first introduction to Pimm's was a day at the races at Sandown race track on a visit to England – magical! Thanks for this lovely post! Oh, Pimm's, how I love thee. It's impossible to find it here in Quebec, but just a hop, jump and skip over the border in New Hampshire, you can find it. I don't know how I managed to make the last bottle I bought last a year but I'll be sure not to make the same mistake again. Pimm's Cup: the quintessential summertime drink…right after gin & tonics. Also, if you are a fan of gin, do seek out Victoria Gin from B.C. It should be available in Washington state and it is, quite frankly, one of the finest gins I've ever had the pleasure to taste. Pimm's tastes much better if you ditch the fruit and serve it with mint and cucumber. Please try it that way! Oh, Molly. This is just so classic you. Even if you did turn over a new leaf, “starting today”. For my part, I've loved Reed's Ginger Brew ever since managing a wee thriving cafe on the UW campus, when it was new and no one would buy it. Am in love with the idea. Thx for following through. Cheers to you! The Pimm's Cup is my very favorite summer brew and my kitchen seems lackluster and lonely without a bottle on the counter. Very much enjoyed reading this post, and am wishing my dad had a bottle here somewhere (we're visiting him in Santa Fe, and off to a tapas restaurant tonight to decided what we want to serve at our wedding next summer! Tally Ho!). Enjoy the rest of your weekend! I shared my first Pimm's cup with an old geezer friend of mine when it was over 100 degrees outside and I was in the VERY late stages of pregnancy with my 2nd babe. You are too funny! I have never tried this–but I guarantee you, I will now! There's nothing better than a jug of Pimm's to cool away the heat and humidity of summer. I'm getting all homesick for Sunday afternoon's at a London pub garden with friends all sat around a ice cool pitcher of Pimm's and lemonade. Ah, love Pimm's. Had some this weekend, and used a lemon ginger simple syrup I had made as the mixer (with seltzer and the usual garnishes). I remember drinking these when living back in London – oh the memories! Any recommendations as where to find Pimms? Pimm's is one of those things I've always been casually curious about, but apparently not curious enough to research what the heck it is. Thanks for educating me! I'll admit, the garnishes are what really reeled me in. Do you think this would be weird with diet ginger ale? I haven't wanted to hit up a liqour store before noon on a Monday in quite a while. Loved this post. I feel like you finally have your blog mojo back after the crazy year you had with Delancey and the Book. Pimm's is awesome, no doubt. I have many happy memories of drinking it in sunny pub gardens. But on our honeymoon to England in November 2005, a lot of pubs had Pimm's #5 (I think), which is brandy-based, and was served hot, mixed with apple cider (non alcoholic, I think) and in a pitcher filled with floating orange and apple slices. Also heavenly! I've never actually tried Pimm's, but I'm now inspired to do so. I love ginger, too, so this seems like the perfect summer cocktail. Also, just finished reading your book this weekend and I'm so inspired. Thanks for all you do. Love my Pimms! Been tipping these back since Memorial Day. I can't wait to try it with some real deal ginger beer! awesome! i want! sounds fantastically summery. As they say, it must be 5:00 somewhere in the world. Cheers! Oh, how great to see you covering Pimm's! I'm a typical English girl in that I love Pimm's in the summer. 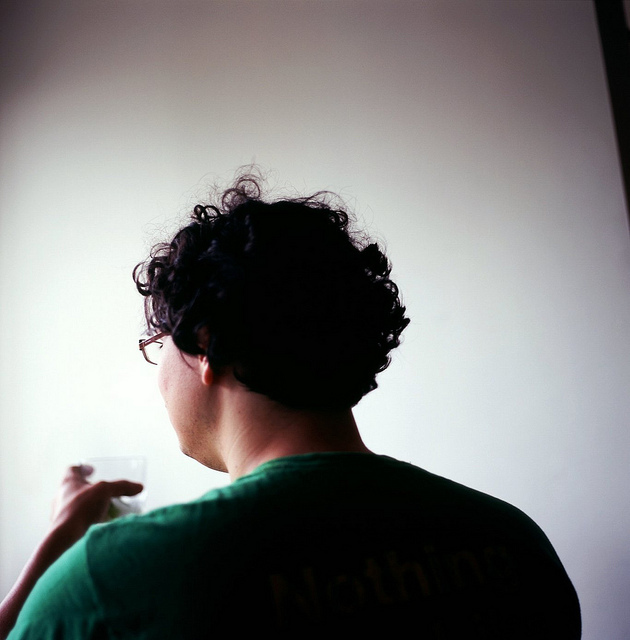 I've blogged about it several times, and video blogged it too! Fabulous drink. Molly, this is perfect!!! It is 95 degrees in OKC and I have a NO. 1 bottle of Pimms that has been my bar since, well since you and Jennifer were hanging out by the pool. Never knew what to do with it till now – headed to the store to get all the other ingredients! Thanks, Sweetie! For the life of me, I cannot remember my first Pimm's (it will come to me tomorrow), but the hubby and I have been hooked ever since. We love serving a pitcher of Pimm's Cup as an aperitif at parties and have been known to resort to the more standard Pimms and 7-Up as an everyday summer sip. Move over Dark and Stormies, it's time for Molly's Pimm's Cup. Cheers! Just read the lovely little write up of Delancy in Culture. Wish I lived closer so I could try your ricotta. I'm about to try and make my own. Any hints or suggestions before I start? I adore cucumber in Pimm's — it's kind of a green sweetness — so much so that I found a cucumber sparkling water, and added that to the Pimm's/lemonade instead of plain soda. Delightful! I've never even heard of Pimm's. Maybe its just not to be found up here in Canada. But your post sure makes me want to find it! I too was introduced to Pimm's Cup in London. Lovely! But it was the Winter Pimm's made with the addition of Brandy I think. Anyway it was the perfect drink for a cold winter night with Christmas just around the corner. More ideas for your research!!!! Could this be any more delicious? This may be a stupid question, but since it is an infused alcohol (as I understand it), does Pimm's ever go bad? I ask because I inherited a bottle from an old roommate when he moved out… but that was five apartments ago. Think I've had this bottle about ten years. Never been used because I was scared of it, although I think it might have been opened once. Still good? No good? I don't think of alcohol as ever going bad, per se, but I just wonder if I'm pushing it here…? one of our favorites – and haven't had one in at least a month, thanks for the reminder, cheers! We have been drinking so much Pimms Cup around here this summer. The current iteration is a ginger simple syrup, lots of lemon juice, mint, cucumber, maybe a thinly sliced lime, and a splash of seltzer water after it's poured in the glass. I don't know, though…your post means more research might be necessary. Twist my arm. Happy blog birthday, and wedding anniversary! Looking forward to concocting this one. Beautiful site. Lovely photos. Now I totally want to go out and try this. Thank you for such a fun post!!! As someone (way up the list of comments) said, borage flowers are the classic garnish. Oh… and thanks for the link to Jeeves & Bertie section of YouTube. I will now waste the rest of the afternoon, possibly with a restorative B and soda. Bubble-Up. My parents used to drink them with Bubble-Up. It was totally their drink. You get an A+ gold star happy dance for reed's ginger beer, my favoritest ginger beer ever. The other day I was walking to the library and I saw a whole car with Reeds logos all over it, I guess the librarian or patron was a huge fan of it? Try using champagne instead of fizzy soft drinks, and add a good glug of gin too. Summer afternoons will be glorious, and you could wake up anywhere [even London], fully clothed or otherwise! I've never actually had Pimm's as far as I can recall, but the nice simple cocktails sound delicious. 🙂 And, I mean, who wouldn't want to end up in an episode of Jeeves and Wooster? Sounds good to me! Mmm sounds delicious! I loved reading the post, reminded me of my first (and only) time I had it in New Orleans and it was so yummy and fun to carry around on the streets in the rain. This makes me want to drink it all over again, even in the fog! While on vacation in Oregon, I picked up your book,A Homemade Life, in the bookstore. I have made about 10 of the recipes so far, and am going to make the stew this morning. My daughter got it on my recommendation and enjoyed it as well. Thanks for the blog and the book. My first Pimm's experience was in a city outside of London and I was hooked – it too ended up being a great day (Pimms, the UK, and Richmond Gardens what more can you want?) and I have been looking for a good Pimms recipe. Ginger beer seems to be the answer. I have been drinking So Much Pimm's this summer. I use Hansen's ginger ale usually, only because it's the only _actual_ ginger ale sold in any nearby-to-me stores that comes in cans instead of harder to store, easier to break bottles. I use way more cucumber than you do (and muddle it a bit first, to get the flavor in there) and a combination of fresh basil and mint. Also a couple of lime slices, squeezed and left in the glass. Sometimes I add a bit of other fruit (strawberries or other citrus) if I have it around. But I really like it to be somewhat cucumber-heavy, personally. Has anyone found borage here. I grew it specially in England, and it was hardy, but then so is rosemary, and it won't winter in the Boston area. Molly- thanks! I've been meaning to make Pimms Cup all summer for our beach house and it just worked out perfectly this weekend…we made 2 varieties- a ginger beer (Goslings) kind and a ginger ale kind (for those with daintier palates). Both were a huge hit, we had to make a 2nd run to the liquor store for more Pimms. Your Pimms Cup is now in the running for “drink of the summer”. Oh my God. I had never made Pimm's cup before, but I decided it was time to use the 10-year-old bottle I've been toting in my liquor collection forever. I used Gosling's ginger beer also, and although I was tempted to cheat and skip some of the garnishes, I'm so glad I didn't. Got real lemon, mint leaves, cucumber and strawberries. Oh man oh man. Awesome. As a UK girl, I have tried many variations on Pimms; my favourite is a version we call Classic Pimms, which involves 1 x bottle of Pimms, 1/2 bottle Cointreau, 1/3 bottle brandy, 1 x bottle of lemonade and 2 x bottle tonic, split evenly into pitchers, muddled with mountains of mint and topped with wafer thin cucumber slices – absolute heaven for a big party punch! The perfect summer drink here. Lovely! Thanks for providing us with a great recipe here. Keep up the good work! I just stumbled upon your blog today and Pimm's caught my eye. It always does as it is close to my heart. My great-great grandfather invented it way back when. And this is not just bragging rights and by no means indicates that I am set for life as my family sold it all way back when,but when I see the love for the best summer drink ever (no bias here :)) it makes me smile and I enjoy that people around the world are enjoying it. Keep on enjoying, regardless if you use ginger beer, ale, lemonade…the key is the strawberry and cucumber in my opinion. Who was your great-great grandfather? Where was he when he made his great discovery? What was the situation (was he trying to do something else when divine intervention struck)? but then tonight i decided to go back thru my old bon appetits and found, in the feb 2006 issue, a little blurb right at the beginning (pg 20) describing the pimm's rangoon: pimm's no. 1, ginger beer, cucumber slices, an orange wheel, a strawberry & a lime wedge. hmmm….. I'm a relative latecomer to your lovely blog and saw your interest in ginger beer with Pimm's. I have recently been making home made ginger beer and thought I might suggest this very simple recipe if you want to go to a little trouble and can find a good fresh piece of ginger at your market. Blend together in a very clean blender, one 2 inch piece of thinly sliced pealed ginger the juice of two reamed out limes and enough water to liquefy completely. strain into a clean 2 L. soda bottle add a cup of sugar and fill with room temp water leaving a cups worth of space for the yeast and water and shake to dissolve the sugar. I used raw sugar. In a cup of warm water add 1/4 tsp either bread yeast or champagne yeast and a Tbsp. sugar to proof the yeast. Combine the yeast with the ginger lime water and shake with lid screwed on. leave it out on your counter for a few hours checking periodically until in feels as hard as a store bought bottle of soda is then refrigerate over night. you can use it within a day or two. Just don't open it fast or you will have an overflow. Release a bit of pressure once in a while if it needs it. It is lightly cloudy as the starch from the ginger and some yeast gets a little agitated with the effervescence, but it doesn't effect the taste. Looks a little like Fresca but tickles the nose. You can substitute lemon instead, but limes are less expensive around here. Just thought since you like food projects you might like this one. I'm going to have to try the Pimm's with my next batch. Finally tried a Pimm's Cup at El Moro, the new cool bar in town where I live in Durango, CO! It was a hit. My thermometer says it is 103F outside in The Dalles, Oregon, hot enough for a Pimm's Cup. Plus I had a bottle of real ginger beer (A.J. Stephens) on hand. Here's to you and your great recipe for a very refreshing drink! Cheers!